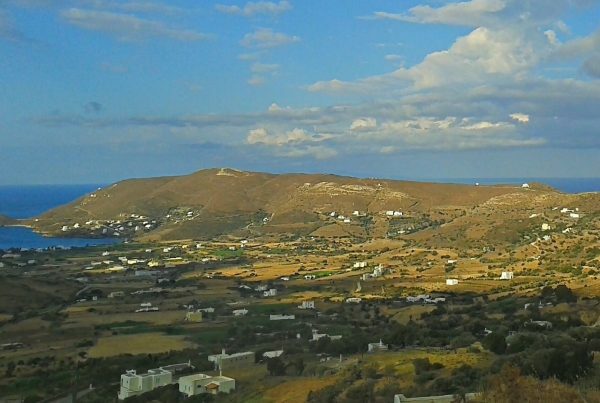 Batsi, Andros’ main resort, lies 7km southeast of Gavrio port on the overbuilt shores of a handsome bay with a long beige-sand beach. Despite its touristy character, Batsi has kept a traditional and picturesque charm. This attractive town has little red-tiled colored houses built amphitheatrically over a bay with a lovely fishing harbor at its south end and a nice beach on the other side. Outside Batsi you will find nice quiet beaches such as Chrissi Ammos north of the town, about three kilometers away. Some lovely, quiet beaches can be found south of Batsi. From Batsi, which today has about 1,000 permanent residents, you can make all kinds of day trips in the area. The monastery of Zoodochou Pigi and the traditional villages of Katakilos and Arni, where mills and creeks can be seen, are worth a visit. As an important tourist destination it offers all necessary amenities: taverns, night-time entertainment, tourist agencies, hotels, rooms for rent, post office, banks, car and bike hiring agencies and many shops.